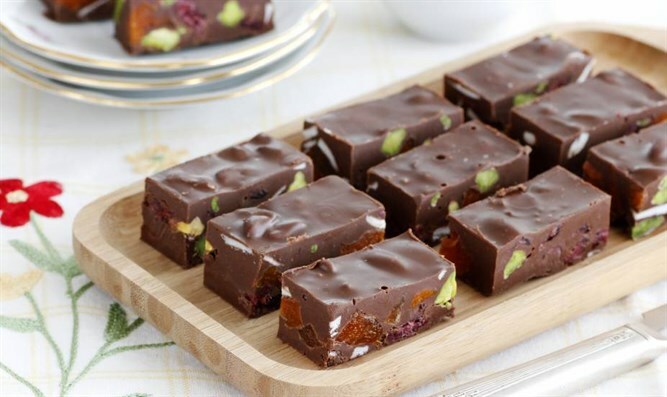 These chocolate bars are easy to prepare, gluten free and very tasty with pistachios, cranberries, apricots and coconut. Break the chocolate into cubes and put in a bowl. Add peanut butter and salt and melt together in a microwave or double boiler until everything is melted and the mixture is smooth. Add pistachios, cranberries, apricots and coconut chips and mix evenly in the mixture. Pour the mixture into a 30-centimeter (11- and- 1/2-inch) loaf pan and smooth out the top. Cool for about one hour in the freezer until completely firm. Cut into squares of the desired size and serve. Keep the bars in a closed container for up to 10 days in the refrigerator. Bars can be frozen for up to one month. You can vary by using any type of nuts or dried fruits that you like in the same quantities listed above.